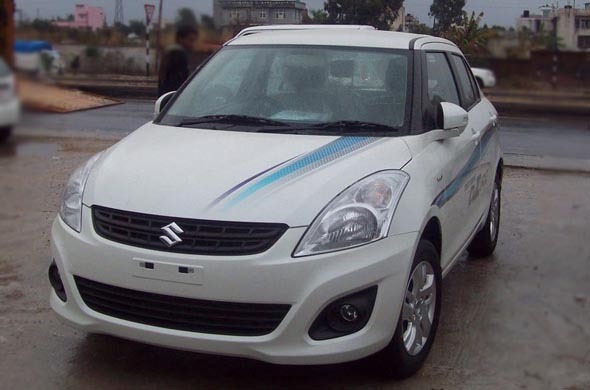 Maruti Suzuki to launch Dzire compact sedan in February! 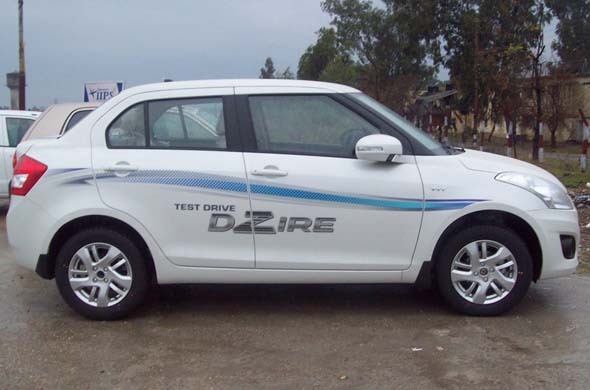 Maruti Suzuki will launch the new Dzire during the first week of February 2012. The new Dzire will measure less than four meters in length as was expected. Surprisingly, the new Dzire petrol will be offered with a 4-speed automatic transmission on the Vxi and Zxi trims though the diesel version will come with 5-speed manual transmission only. The new Dzire is expected to be priced close to the outgoing model which is priced between Rs. 4.94 lakh – Rs. 7.29 lakh. The new Dzire looks similar to the new Swift but has subtle differences which tend to go unnoticed at first glance. When compared with the Swift, the upcoming Dzire has a horizontally slit radiator grille, wider air dam and bigger housing for fog lamps. In profile, there are minor changes in the shape of the rear quarter glass and the size of rear doors. The taillamps have been redesigned to give it a fresh look. The thick chrome strip running across the width of the boot door renders a premium appeal to the car. Overall, the Dzire is one good looking compact sedan. 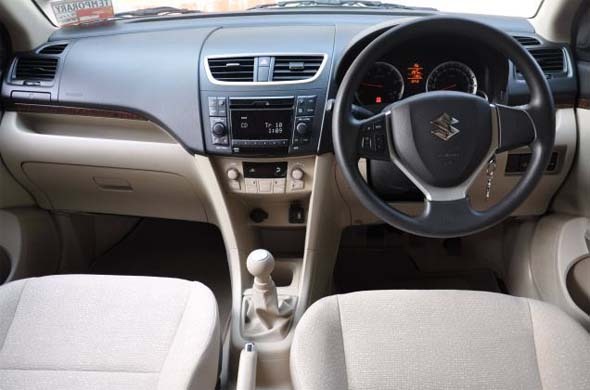 On the inside, the new Dzire gets a Swift like cabin. The black-beige upholstery will likely brighten up the interiors. With regard to comfort, the new Dzire will be as comfortable as the new Swift on which it is based. Hence, expect good room for front passengers, while the rear will be best for two occupants and tight for a third passenger. The new Dzire will be powered by the same engines that power the new Swift. The 1.2-litre K-series petrol motor puts out 86 bhp of power and 1.3-litre DDiS motor churns out 74 bhp of power. The fuel economy of the new Dzire is similar to that of the Swift which is 18.6 kmpl for the petrol version and 22.9 kmpl for the diesel version. Expect the performance of the new Dzire to be similar to the Swift as well, especially as the car’s length has not added any weight. 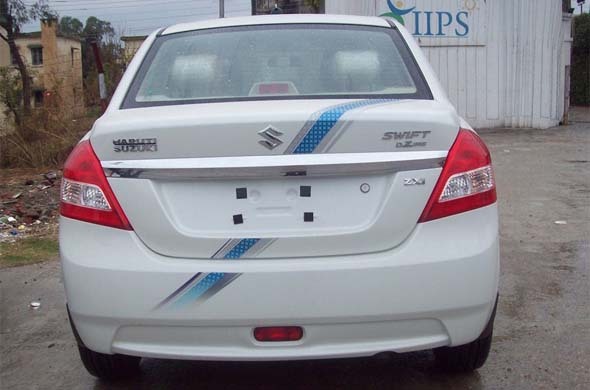 In fact the Dzire weighs just as much as the Swift. The new Dzire will likely come with all the features available on the Swift hatchback. The top-end variant of the upcoming Dzire will get features like automatic climate control, steering wheel mounted illuminated audio controls, driver & front passenger airbags, ABS with EBD, brake assist, integrated music system with speakers and alloy wheels. There were expectations that the new Dzire will be priced substantially lower than the present model. However, the new features, facelift changes and upgraded interiors may likely bring its price close to the outgoing model. The new Dzire will start at around Rs. 5 lakh and it may go up to Rs. 7.5 lakh for the top-end diesel variant. The new Dzire will take on the Tata Indigo CS priced in the range of Rs. 4.58 lakh – Rs. 5.80 lakh. The new Dzire may soon face new competition in the form of the Mahindra Verito compact sedan and Tata Manza compact sedan. The new Dzire looks smart and will most likely attract buyers looking out for compact sedans. Buyers who had booked the outgoing model may also change their plans and go for the newer version. On the other hand, it is not yet clear whether Maruti Suzuki will discontinue or retain the current Dzire once the new Dzire is launched.